A Piccadilly Valley flagship, recipient of the most impressive accolades since inaugural release. Fine and elegant, displaying intensely complex varietal character of dark cherry, strawberries, spices and game, with wonderful length and intensity of colour. 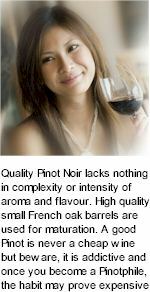 The palate is rich and voluptuous, the tannins soft and silky, the aftertaste long and lingering. Most of the grapes are sourced from vines at Uley Vineyard which were planted in 1983 and are now expressing their maturity. Like all great wines, Barratt is made in the vineyard and assembled from the best of barrels of vintage. Ruby coloured. A strongly varietal aroma of dark cherries, floral and spice, with gamey, earthy complexity, followed by a beautifully integrated palate of sweet fruit and spice, supported by soft, silky tannins, a wine of outstanding structure and length.